Worldcom beauty nails has yours solutions for all your beauty and style needs in manicure, pedicure, spa and much more. With over 1000 nail items to purchase, from acrylic nail kits, gel nail kits to uv lamps and nail drills as well as nail art items and professional nail salon products, you are sure to find what you are looking for. As the nail art become more and more popular, women are becoming more and more addicted to buying different nail art accessories to improve nails’ look. We supply nail stikers,nail art pens,acrylic nail art flowers and so on. Womem can use them to look sexier and more appealing. 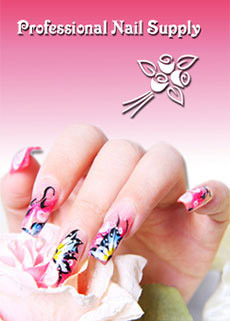 The nail art goods in our shop have high quality and competive price. Choose the one you need to be in fashion! We are specialist nail supply, specialising in the most talked about amazing manicure innovation nail products. Your Nail and Airbrush Makeup Speciality Store. We have everything you need to keep your costumers nails looking great - whether they prefer thier nails simple and short or glamorous and long! With a great selection of Nail Couture to choose from, show off thier fingers and toes and extend fashion to thier fingertips and toes today! !